Well he won’t be losing ME, cos I never listened to him in the first place …. and if he was one of the “most popular” podcasts around, that’s even more reason I’d never listen to him ! — Bottom line is , the word “popular” sure don’t ‘cut any ice’ with me ! Ricky Gervais is a comedian, but I can’t say that I was impressed by his work in “The Office”, and I don’t listen to podcasts for comedy, so he will neither be losing or gaining me…or getting my money. I have to agree with your statement John, “Bottom line is , the word “popular” sure don’t ‘cut any ice’ with me !”. I might listen to some popular podcasts, but that is because I enjoy them, not because anybody else is listening. I would suggest that Ricky is either being foolhardy by thinking that he can cash in on his popularity AND keep his audience, or he doesn’t care about his popularity. I don’t know which it is, but I would hope it is the latter. Maybe charging a small fee to cover costs is ok. They have done twelve for free and Karl Pilkington is unemployed. The first twelve shows where an experiment albeit a pilot. If they became successful the team would return later in the year (after filming second series of ‘Extras’) to do another twelve. However the reaction and success after the first twelve has been phenominal. Judging from listener feedback, most of the listeners were prepared to pay for another series now rather than wait until the end of the year. He did the ‘Pilot’ for ‘The Office’ and he was not paid to do that. It became successful hence he was paid to make a series. Considering Mr Gervais was offered 18 million pounds to do a third series of ‘The Office’ and said no, I don’t think he is the type of person who would cash in on his popularity. He also knocked back a large amount of money and fame when he declined Tom Cruise’s invitation to star in ‘Mission Impossible Three’. Point to note. Mr Gervais has had a long history with radio. He worked for ‘XFM’, ‘Capital Radio’ and ‘Radio One’. The accusation that he is only cashing in now is totally preposterous. He and his team have worked very hard to get where they are – and that’s without any ‘cash for comment(s)’ on their previous radio shows. John B1_B5. He is the most popular podcast at the moment but that was not always the case. To exude prejudice just because a Mr Gervais’ download statastics have made the ‘Guiness World Book of Records’ , is the height of ignorance considering you have never heard their show. We live in a world where intellectual property is rarely free Samuel. I think you may be being a bit harsh on Mr Gervais. I was not impressed with his work in ‘The Office’ either as most of it went over my head. If your podcast became as popular is Mr Gervais’ and to cover your costs and make some money, I would gladly pay a reasonable fee to purchase yours. Because I enjoy it. I will also pay for Mr Gervais’ new series because I enjoyed the first twelve and understand that they have to make a living too. OK, sure, it will be an income source for him, and he may deserve it, I’ve never heard it and don’t intend on doing so, so I’m not going to pass judgement on his podcast. The point I was making is that I don’t see pay-per-download podcasts being a viable idea in the long term, mainly because they will have trouble gaining listeners due to the “Do I really want to spend money on something that I might not enjoy” mentality of most people, which is especially true for low cost items. The other point I made is that Ricky will lose listeners who may have enjoyed his show, but don’t really want to pay to hear it. My personal opinion is that people would are more interested in paying for something they can watch than something they can listen to. I just think Ricky would have more success from ads or voluntary donations than pay-per-download schemes. If it works for him, great, but he won’t be getting my money, and I won’t be employing his method, and I will probably stop listening to anybody that does. This Week in Tech is my favourite podcast, but I would not continue to listen if I was forced to pay to do so. I’m happy sending them some money every now and then voluntarily, and I would be happy if they had ad breaks, but I would be really annoyed and angry if they forced me to pay to listen. The other problem I see with pay-per-download podcasts is that they will only appeal to a limited audience. For example, if George W. Bush was to have a pay-per-download “National Radio Address With Extras” podcast, he would be unlikely to have any listeners outside of his political persuasion, and even more likely to get anyone outside of the US. Same goes for Bill Gates having a PPV “Microsoft News” podcast. The accusation that he is only cashing in now is totally preposterous. Well, it’s either that or he doesn’t care about his popularity, I suspect it is a bit of both. That’s mighty nice of you Chuck, but I would prefer to have optional donations or a small amount of ads. Ricky may make some money out of this, that’s fine, I’m not begrudging him of that. I just don’t support or think that pay-per-download podcasts are going to be a huge success. I think John was just making the point that he doesn’t listen to podcasts just because they are popular. Everything which is popular is going to have a certain amount of people who will dislike it, if they’ve experienced it then it will be an “I don’t get it” situation, if they haven’t experienced it, then it’s a “What’s the big deal?” situation. For me, in this case, it is the latter. I’ve heard of Ricky’s podcast, I’ve read some descriptions, and it just doesn’t appeal to me, but that not the reason I am criticising Ricky’s decision. As I stated earlier, I would be just as critical if This Week in Tech did the same thing. If you want to pay for it, go right ahead, my point is that he will only have a subset of his current listenership paying to continue listening, he will be hard pressed to attract new listeners. Point taken Samuel. I would, however, prefer to pay to listen to ‘The Ricky Gervais Show’ if it means that I don’t have to listen to advertising. However, the first series is and always will be available for free. The first series is a sample and if people like it they have the option of purchasing the next one. Most other pay-per-view podcasts (video/audio) only offer a few seconds of video or a small sound byte. I think that Mr Gervais has been quite generous in providing twelve episodes for free. Authors and listeners have the option for charging or paying for digital material. iTunes has almost reached one billion downloads for music. I think that if you reach the popularity of ‘The Ricky Gervais Show’ then the only viable option is pay-per-view. “The first twelve shows where an experiment albeit a pilot. If they became successful the team would return later in the year (after filming second series of ‘Extras’) to do another twelve. I would be annoyed and angry too if my favourite podcast decided out of the blue that they were going pay-per-view. Yet, Mr Gervais did state in the first episode that his podcast was an experiment. Maybe he doesn’t care about his popularity or his ego. I think this is admirable. I hope that John does not mind you fielding a retort for him. Mr Gervais’ podcast was not always ‘popular’. I think John dismissing something because it is popular reflects an insular view. Yes being popular does not make something good, but if he has problems with the word ‘popular’ blame the Etruscans. Podcasting is still in it’s infancy and at the same time untested. Mr Gervais will provide a good yardstick. I would agree with you that he will lose some listeners. But providing a whole series for free will still get new ones. I again state that I would rather pay a small fee for something I enjoy if it means I do not have to listen to advertising. I don’t want to take advantage of Mr Gervais’ benevolence. It would be nonsensical for him to do another series if it means he is losing big dollars. The listeners have demanded more and he has responded reasonably even if it is pay-per-view. Jam Tart. I am sure you will have a field day with my spelling and grammer – ‘still in it’s’. Should be ‘still in its’. alright, if he announced it at the start, then fine, at least everyone knew what they were in for. I still don’t like the idea, but then again I’m willing to listen to ads. You’re right Chuck in that podcasts as popular as Ricky’s do have large costs associated with them, hosting and bandwidth in particular. I have 250GB of bandwidth per month to play with here, so I don’t have anything to worry about at this stage, but (I know I keep referring to it, but I have some actual data I can use with this one) This Week in Tech for example average 280,000-290,000 downloads per week, which is small compared to Ricky’s 400,000 per week, but none the less would cost a small fortune. Let me calculate my last episode’s high quality version (39,609,710 bytes) downloaded 400,000 times in full each week for four weeks. That would be 63,375,536,000,000 bytes, or just over 63.375 TERABYTES, which is of course just over 63,375 GB. So yes, it would cost an awful lot to run a podcast with that many downloads, the only reason TWiT survives is that AOL have given them bandwidth in exchange for one mention of AOL Radio per episode, and the rights to replay TWiT on AOL Radio’s podcast channel forever and ever. Still, pay-per-download podcasting is something which will only ever work for established and popular podcasts, especially if they have some free episodes. There is no way, on this planet at least, that new podcasts will be able to work on a pay-per-download basis, although I’m sure someone is going to try it now…probably someone with 2 visitors per day on their blog. Yes well …when it comes to the word “popular” ( in ANY field ) I usually go in the opposite direction, because I make up my OWN mind what is ‘popular’ with ME. I really don’t give ‘ two hoots’ what the ‘masses’ think . And I won’t give you that corny old line of what Hitler said about the “masses” ( behind their back of course, to Albert Speer one night at the Berghof ) …… however…. I do believe I saw a similar ‘line’ on “The Spin” regarding the “stupidity of the masses” ……. I agree Samuel. It could only work for established podcasts that download on a mass scale. Nobody would donate to these ones. I do agree with your idea of donations for smaller ones. According to Albert Speer’s book “Inside the Third Reich” (1970), Hitler spoke to him on a number of occasions about the “stupidity of the masses” ….. not only at the Berghof on the Obersalzberg, but also in Munich, and once at the “Zeppelin Field ” in Nuremberg, where Speer (an architect ) had been awarded a contract to ‘refurbish’ the Zeppelin Field for Party Rallies from late 1933 onwards. Architects are renowned for being pompous and egotistic. The famed Dane Jorn Utzon epitomised this when he stole all that money from the NSW government and took off without finishing the Opera House. Because of Speer’s grandios plans for Germany he diverted Hitler’s attention away from winning the war. Speer hoped he could start from a clean slate but the Russian architect Volstek ruined this because of his plans for a huge wall seperating east and west. Hitler would have never called his people stupid. Einstein is proof of that. If it weren’t for meddling conceited architects, we may have a Third Reich today. ‘Hey Dad’ would have never have been made. Architects are the problem with this world. Look at Federation Square in Melbourne. Is it an architecural wonderland? Or a self indulgent nightmare? I bet it was an architect who got Professor David Irving locked up. Of course nobody can prove or disprove whether Hitler actually said that to Speer … and speaking of David Irving , the “Holocaust Denier” , it’s interesting to note that in Speer’s book (and at the Nuremberg Trials), Speer denied any knowledge of The Holocaust , which I’m inclined NOT to believe………so..if he lied about THAT…. it’s possible that he lied about what Hitler allegedly said ‘off the record’ … It’s obvious that Hitler enjoyed being “popular” , and only at the very end did he rail against his own people for being “too weak” and “not deserving” of a great leader such as himself , but this didn’t happen until the Soviets were only a stone’s throw away from the Fuhrerbunker. This is just one example of the absurdity of what is, and what isn’t “popular” . Are you talking about the popularity of the Holocaust? I think this photo will further illustrate your point John. Hmmmm ….. even Alec Guiness looked more convincing as Hitler in the movie “Hitler-The Last Ten Days” than THAT poor imitation in the photo . Bruno Ganz plays an even better Hitler than Chaplin. “Der Untergang – Hitler und das Ende des Dritten Reichs” (“The Downfall: Hitler and the End of the Third Reich”), 2004. Robert Carlyle was not much chop in the Hitler telemovie though. Yeah, Bruno Ganz was pretty good actually . 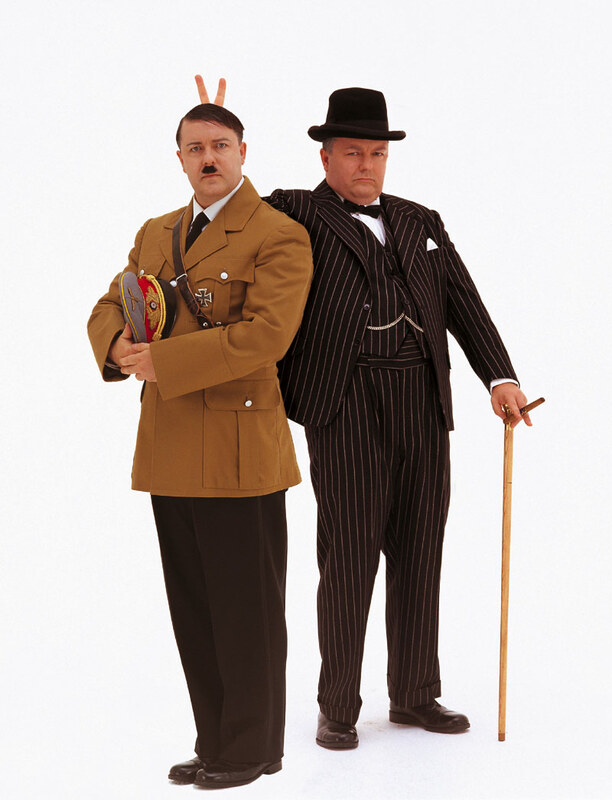 I think “Hitler: The Last Ten Days” with Alec Guiness as Hitler, inspired that 2004 movie . Is it worth watching? Is Sir Alec’s secretary as hot as Ganz’s Bavarian looker? The problem is ….. the movie doesn’t seem to be available ANYWHERE ….. not even on DVD ! It was made in 1973. Hmmmmm ….. not bad ! ……. better than the REAL Traudle Junge (one of Hitler’s secretaries ). On Sunday morning at 12:30 (yes, half past midnight) John Kerr has a “Flicks and Things” segment with Dale & Simon (whose last names I’ve forgotten). These two know just about everything you could ever want to know about movies, you could ask them about the movie! I’m sure John Kerr would be happy to hear from you again too. Shall do . It doesn’t look as though this movie will be coming out on DVD, but they might know where I can get a tape version of it . It’s not available in Australia, but maybe one of their listeners might know something . Hmmmm …. I just had an idea …. I’ll give it a try on The Trading Post …. maybe somebody in Canberra has a copy they want to sell .